Tennessee's Kyle Alexander walks off the court after the Vols lost to Auburn in the SEC tournament title game Sunday in Nashville. Auburn won 84-64. 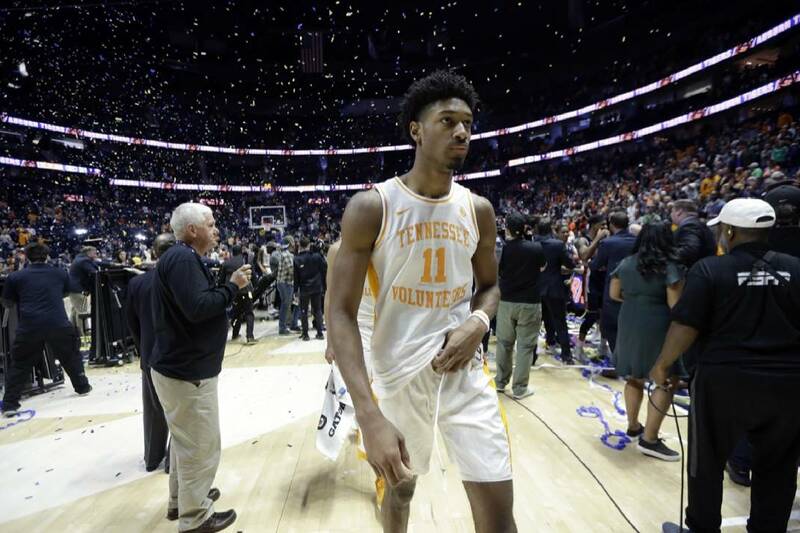 KNOXVILLE — Monday was a time for recalibration for the Tennessee men's basketball team. Gone is the chance to repeat as Southeastern Conference regular-season champion. LSU held that title after the Volunteers fell at Auburn on the last day of the regular season. Gone is the opportunity to win an SEC tournament championship — the first since 1979 — as the Vols lost to the same Auburn team eight days after the first loss, which probably knocked Tennessee off the one-seed line for the NCAA tournament. All of the team's focus is on the next step, the field of 68. The 29-win Vols will face Colgate in the first round of the tournament, on Friday at Nationwide Arena in Columbus, Ohio. Tennessee and the Raiders will tip off 30 minutes after the conclusion of the Cincinnati-Iowa game, which begins at 12:15. On Sunday, the Vols were unable to recreate the emotions needed to defeat Kentucky 82-78 in the SEC semifinals at Bridgestone Arena, a game in which Tennessee rallied from eight points down with 2:58 to play. The win halted the Wildcats' 13-game win streak in the tournament, as well as ending a string of four consecutive championships. Sunday, the Vols looked lost. They lacked focus, dropping passes and missing wide-open layups. Coach Rick Barnes said he thought the team played defense pretty well, but the Vols' 17 turnovers — 12 in the first half, including on seven consecutive possessions — led to 21 Auburn points. "Whether you win or lose, you have to flush it out," Barnes said Monday. "We have a team that — what's our record, 29-5? — I mean they've had to flush out a lot of things whether it's win or lose. If you start thinking you're too good, you're going to get beat. We've been in some close games. "Our guys were disappointed. And I'd be disappointed if they weren't disappointed. You don't get a chance to do that often. Some teams do. Some teams gets more chances than others to play for conference championships and regular-season championships. But the fact is, this group of guys, I can tell you every guy in this room four years ago would not have thought that was going to happen with this group of guys. But they've done a lot and we've had a terrific regular season. Now we have to go in and see if we can make this the best postseason we can possibly make it. I think we have the kind of leadership on this team that will embrace that and look at it and be excited to get started and play." Tennessee doesn't have the sort of basketball history to where anything can be taken for granted. Since the NCAA field expanded to 64 teams in 1985 (it has since been expanded to 68), the Vols have advanced to the Sweet 16 five times, to the Elite Eight once (2010). They have only 10 SEC regular-season championships and only four tournament titles, with a drought of 40 years now in the latter. Grant Williams stated earlier this season that he wanted to hang banners in Knoxville. His only chance, this year, now will have to come by accomplishments over the next three weeks, but that doesn't mean he considers failing in repeating as SEC champs and in pursuit of the tournament championship a black mark for the program. "We want to go all the way, but I think we've been successful this entire year," he said. "Just because two games didn't go our way and we didn't play well in those games doesn't mean the year wasn't a success. People are always trying to say that just because you don't hang a banner, if you look back at a team and they didn't accomplish what they should have, but I think we did a lot this year. "Not many teams get 29 wins in a season; not many teams produce the talent and develop the way we have over the years. Look at Admiral Schofield, look at Kyle Alexander: Where they've been from freshman year to now, not many teams can say they've done that. "I think that's where respect comes in and understanding this team has a lot more it can do, but don't discredit anything from the past."